A bunion is an enlargement of bone at the great toe joint. Tight shoes don't cause bunions, but they can aggravate them. Bunions are often inherited and become worse over time if left untreated they can cause pain, swelling, skin irritation and other foot problems. Can become worse over time if left untreated they can cause pain. Pain and reduced motion may occur as arthritis develops. You should have a foot examination as soon as possible if you have this condition. Redness, swelling, or pain along the inside margin of the foot just behind the great toe. Moderate to severe discomfort at the bunion when wearing shoes, particularly if tight fitting. A painful callus may develop over the bunion. Sometimes a painful corn on the adjacent sides of the first and second toes. Irritation if there is overlapping of the first and second toes. Arthritis may cause stiffness and discomfort in the joint between the great toe and the first metatarsal. There may be a fluid filled cyst or bursa between the skin and the "bunion bone". Skin over the bunion may break down causing an ulceration, which can become infected. The choice of surgical procedures (bunionectomy) is based on a biomechanical and radiographic examination of the foot. Because there is actual bone displacement and joint adaptation, most successful bunionectomies require cutting and realigning the 1st metatarsal (an osteotomy). Simply "shaving the bump" is often inadequate in providing long-term relief of symptoms and in some cases can actually cause the bunion to progress faster. The most common procedure performed for the correction of bunions is the 1st metatarsal neck osteotomy, near the level of the joint. 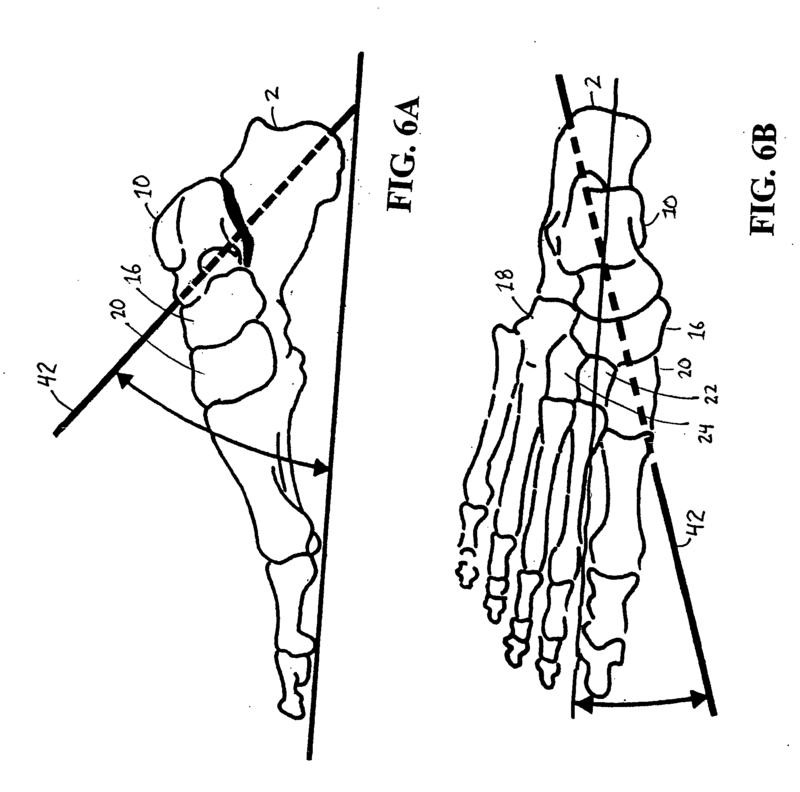 This refers to the anatomical site on the 1st metatarsal where the actual bone cut is made. Other procedures are preformed in the shaft of the metatarsal bone (see procedures preformed in the shaft of the metatarsal) and still other procedures are selected by the surgeon that are preformed in the base of the metatarsal bone (see surgeries preformed in the base of the metatarsal). Sever?s disease, also referred to as calcaneal apophysitis, is an injury in the growth plate of the lower part of the heel bone where the Achilles tendon attaches to the bone. Sever?s disease is a common condition affecting children between the ages of 8 and 15 that participate in sports or are particularly active. This condition is believed to be caused by repeated trauma to the heel, weakening its internal structure. Typically occurring in adolescence, Sever?s disease causes painful inflammation of the growth plate. 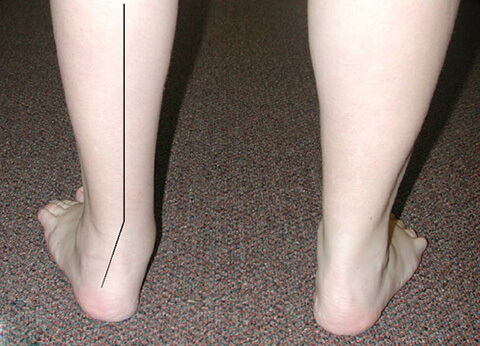 This condition can affect any child, however there is a higher probability of its occurrence if the child experiences pronation, has flat or high arches, short leg syndrome and/or is overweight. Resting the foot and applying ice to the affected area are some of the most effective methods when it comes to treating Sever?s Disease. Make sure the ice is always wrapped in a cloth of some sort. Applying ice directly to the skin can cause frostbite. A monitored stretching program of the lower limbs (particularly of the calf muscles) as well as a small heel lift may also be suggested. 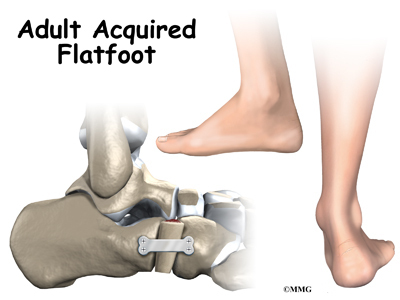 Adult acquired flatfoot is often a complex disorder, with diverse symptoms and varying degrees of deformity and disability. There are several types of flatfoot, all of which have one characteristic in common-partial or total collapse (loss) of the arch. Other characteristics shared by most types of flatfoot include ?Toe drift,? where the toes and front part of the foot point outward. The heel tilts toward the outside and the ankle appears to turn in. A short Achilles tendon or calf muscle, which causes the heel to lift off the ground earlier when walking and may act as a deforming force. In addition, other deformities such bunions and hammertoes can occur and cause pain in people with flexible flatfoot. Health problems such as rheumatoid arthritis, diabetes and obesity can increase the risk of developing flatfoot and may (or may not) make it more difficult to treat. This article provides a brief overview of the problems that can result in AAFD. Further details regarding the most common conditions that cause an acquired flatfoot and their treatment options are provided in separate articles. Links to those articles are provided. It is imperative that you seek treatment should you notice any symptoms of a falling arch or PTTD. Due to the progressive nature of this condition, your foot will have a much higher chance of staying strong and healthy with early treatment. When pain first appears, your doctor will evaluate your foot to confirm a flatfoot diagnosis and begin an appropriate treatment plan. This may involve rest, anti-inflammatory medications, shoe modifications, physical therapy, orthotics and a possible boot or brace. When treatment can be applied at the beginning, symptoms can most often be resolved without the need for surgery. What Are The Leading Causes Of Adult Aquired Flat Foot ? 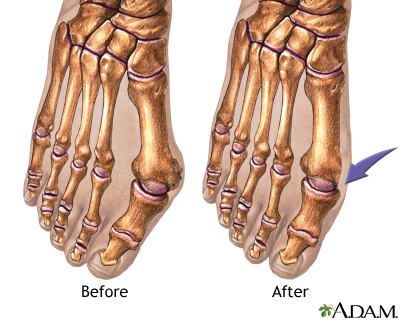 Adult Acquired Flatfoot occurs when the arch of your foot collapses after your skeleton has stopped growing, usually resulting in the foot falling inward with the toes pointing out. This allows your entire sole to touch the ground when you stand, instead of just the outside area. Arches fall for many reasons, including arthritis, injury to the supporting tendons or bones, nerve problems, diabetic collapse, pregnancy, aging, and obesity. A fallen arch doesn?t have to be painful-though as it develops and worsens, it can lead to strain and weakness in the feet that could allow for more uncomfortable foot problems later. Diabetics can develop serious complications from their fallen arches, and need to have their condition evaluated and treated. As discussed above, many different problems can create a painful flatfoot. Damage to the posterior tibial tendon is the most common cause of AAFD. The posterior tibial tendon is one of the most important tendons of the leg. It starts at a muscle in the calf, travels down the inside of the lower leg and attaches to the bones on the inside of the foot. The main function of this tendon is to support the arch of your foot when you walk. If the tendon becomes inflamed or torn, the arch will slowly collapse. Women and people over 40 are more likely to develop problems with the posterior tibial tendon. Other risk factors include obesity, diabetes, and hypertension. Having flat feet since childhood increases the risk of developing a tear in the posterior tibial tendon. In addition, people who are involved in high impact sports, such as basketball, tennis, or soccer, may have tears of the tendon from repetitive use. Inflammatory arthritis, such as rheumatoid arthritis, can cause a painful flatfoot. This type of arthritis attacks not only the cartilage in the joints, but also the ligaments that support the foot. Inflammatory arthritis not only causes pain, but also causes the foot to change shape and become flat. The arthritis can affect the back of the foot or the middle of foot, both of which can result in a fallen arch. An injury to the tendons or ligaments in the foot can cause the joints to fall out of alignment. The ligaments support the bones and prevent them from moving. If the ligaments are torn, the foot will become flat and painful. This more commonly occurs in the middle of the foot (Lisfranc injury), but can also occur in the back of the foot. Injuries to tendons of the foot can occur either in one instance (traumatically) or with repeated use over time (overuse injury). Regardless of the cause, if tendon function is altered, the forces that are transmitted across joints in the foot are changed and this can lead to increased stress on joint cartilage and ligaments. In addition to tendon and ligament injuries, fractures and dislocations of the bones in the midfoot can also lead to a flatfoot deformity. People with diabetes or with nerve problems that limits normal feeling in the feet, can have collapse of the arch or of the entire foot. This type of arch collapse is typically more severe than that seen in patients with normal feeling in their feet. In addition to the ligaments not holding the bones in place, the bones themselves can sometimes fracture and disintegrate without the patient feeling any pain. This may result in a severely deformed foot that is very challenging to correct with surgery. Special shoes or braces are the best method for dealing with this problem. Some symptoms of adult acquired flat foot are pain along the inside of the foot and ankle, pain that increases with activity, and difficulty walking for long periods of time. You may experience difficulty standing, pain on the outside of the ankle, and bony bumps on the top of the foot and inside the foot. You may also have numbness and tingling of the feet and toes (may result from large bone spurs putting pressure on nerves), swelling, a large bump on the sole of the foot and/or an ulcer (in diabetic patients). Diabetic patients should wear a properly fitting diabetic shoe wear to prevent these complications from happening. Precisely What Can Cause Tendinitis Ache Of The Achilles ? The most common site of Achilles Tendonitis is at the heel to 4 inches above the heel. The diagnosis of this problem is made when the following signs are present. Pain in the Achilles tendon with up and down movement of the foot at the ankle. Pain in the Achilles tendon when you squeeze the tendon from side to side. If you are unable to move the foot either up or down, or you have intense pain when trying to walk, you may have a tear of the Achilles tendon, and you should see a doctor immediately. Also if you have severe pain in the calf, with or without discolorations of the skin, you may have a blood clot, and this is a medical emergency; see a doctor immediately. If you do not fall into either of these categories then try the following suggestions. In order to treat the symptoms, antiflogistics or other anti-inflammatory therapy are often used. However these forms of therapy usually cannot prevent the injury to live on. Nevertheless patients will always have to be encouraged to execute less burdening activities, so that the burden on the tendon decreases as well. Complete immobilisation should however be avoided, since it can cause atrophy. Passive rehabilitation, Mobilisations can be used for dorsiflexion limitation of the talocrural joint and varus- or valgus limitation of the subtalar joint. Deep cross frictions (15 min). It?s effectiveness is not scientifically proven and gives limited results. Recently, the use of Extracorporal Shock Wave Therapy was proven. Besides that, the application of ice can cause a short decrease in pain and in swelling. Even though cryotherapy 2, 5 was not studied very thoroughly, recent research has shown that for injuries of soft tissue, applications of ice through a wet towel for ten minutes are the most effective measures. Active rehabilitation, An active exercise program mostly includes eccentric exercises. This can be explained by the fact that eccentric muscle training will lengthen the muscle fibres, which stimulates the collagen production. This form of therapy appears successful for mid-portion tendinosis, but has less effect with insertion tendinopathy. The sensation of pain sets the beginning burdening of the patient and the progression of the exercises.